We recently had the chance to review a tee from Wear Luck. "Talking with women and considering what was going on in their lives, I noticed that women are always doing so much for others. We put everyone in our life and family first. It hit me, I had kind of lost myself in the mix of things…I had no clue what kind of jeans were in style, what shades of make-up were being sold this season, bling/no bling, when did I buy this purse I’m carrying?? WEAR LUCK is a product of TRIVIA Marketing, which provides promotional products and strategies to businesses and organizations. WEAR LUCK is a way we can inspire each person individually. We approach each design with excitement, taking in elements from the environment, snippets of current trends and add an element of curiosity that draws the eye in and motivates the wearer. So take a spin in our world of luck and tell us what you are inspired to do." "Get tangled up in our intricate ivy and floral LUCK design! It's easy to get caught up a busy life, but our lucky colors are here to remind you to take time for yourself. You can never have enough Prosperity in your life, so keep your mind open to possibilities. This extra comfortable bamboo shirt will keep you cozy through your busy day." What we thought: This shirt is so comfy and cute! So maybe I didn't win the lottery the first time I wore it, but hey, I plan on wearing it a lot more:) I love the cute styles at Wear Luck and I think they do a great job at making stylish clothes that are fun to wear. If you would like a little inspiration from your clothes, check out Wear Luck and their assortment of creative colors and styles and get inspired! 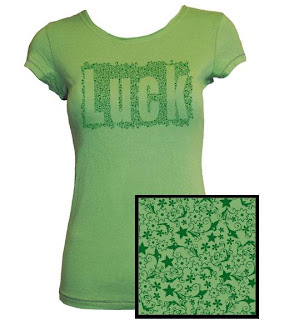 ABCD Diaries gives Wear Luck and the LUCK tee an A+! Buy It: Find these cute fashion statements at Wear Luck! Win It: Wear Luck has generously offered one ABCD Diaries reader a LUCK tee of their very own!! To enter, follow our blog via GFC, then visit Wear Luck and comment below with your favorite style! Christin - THANKS for the post about our WEAR LUCK line! We are seeing tons of people wearing our green shirts today for St. Patrick's Day. Prosperity is in the air today! We are featuring our FAMILY line next month. Have a LUCKY day!! I have some of the shirts from Wear Luck. Love them. It's hard to wear a regular t-shirt now because my Wear Luck shirts are so soft. And they stay soft. I have my Prosperity Green Luck shirt on today..Maybe I'll find a pot of gold. I will defiantly buy more. Awesome! I definitely want the creativity shirt. Or maybe the wisdom shirt. Or romance. So many choices and they're all adorable! I follow on GFC and I like the long sleeved Prosperity Symbol Top. I love the family paisley tree. I am a gfc follower and I like the Health symbol tee. I follow you on GFC and I like the family flower power shirt! I like Wear Luck on Facebook! I follow on gfc and my favorite is the Health Paisley Cross tshirt. I love the Wisdom LUCK shirt. I follow via GFC, thanks! I really like the courage paisley lion - really cool! I follow you via GFC and my favorite tee is the Romance Flower Power Wrap Top! I follow on GFC. I love the Health Coin Wrap shirt. I like the Family Paisley Tee.